The recent availability of Inexpensive Immersion Circulators has had a huge impact in the sous vide arena. Perhaps you have just obtained one of these great products, or have one on the way? In either case you will need to have some sort of sous vide water bath in order to use it. There's nearly an unlimited number of options for a sous vide water bath container including everything from a simple stockpot to the kitchen sink (literally). There are many factors that can be considered when deciding which sous vide water bath is best suited for you but you can go directly to my recommendation if you prefer. A medium to large metal pot can be used as a water bath container. Ideally the pot should be at least 8" (20cm) deep, about 12" (30cm) in diameter and hold around 12 quarts (11 liters). Potential candidates include a stockpot, pasta pot and/or large pressure cooker. The biggest advantage is that you probably already have at least one of these. A pot can be used for normal cooking in addition to being used as a water bath container. Since the metal transfers heat, a pot is a less efficient water bath container requiring the immersion circulator to work a little harder. If you're using a pot as a water bath container you can't use it for its other intended purpose. Normally a round container is not the ideal shape for holding sous vide bags. You cannot use the lid of the pot to reduce heat loss and evaporation so you must use some other mechanism to cover the water bath. You can pick up a Granite Ware 12-Quart Stock Pot at Walmart or Amazon for about 15 bucks. Another sous vide water bath container option is a medium-size plastic cooler. The cooler should be at least 8" (20cm) deep and hold between 12-24 quarts (11-22 liters). 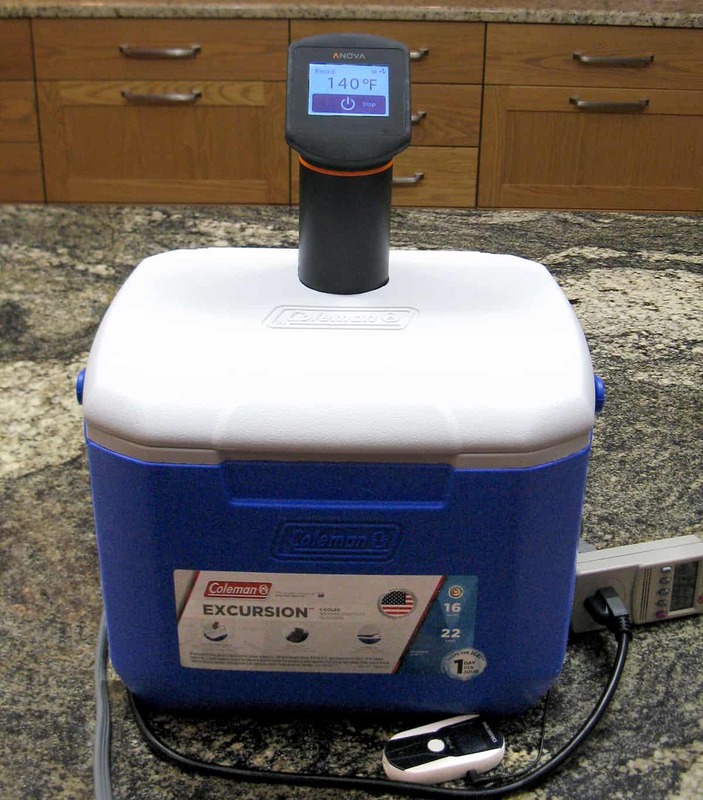 Be sure to keep in mind the amount of water your particular immersion circulator can maintain accurately when buying one of these coolers since some are very large. Most of the immersion circulators today can handle around 5-6 gallons or 24 quarts (22 liters). Plastic coolers come in a wide variety of sizes so that you can pick one that's the appropriate size for the amount and type of food you normally sous vide. The coolers are insulated so that they hold the heat in, reducing the amount of power required from the immersion circulator. If you plan on using the cooler solely as a sous vide water bath, you can usually saw a hole in the plastic top for the circulator while leaving the rest of the top in place. This reduces the heat loss and evaporation of the water bath. The coolers are rectangular in shape which normally makes it easier to arrange sous vide pouches than in a circular pot. Typically these coolers are more bulky than the other container options for a given capacity. This means they take up more room on your countertop and/or when they're stored. Some of these coolers have relatively thick walls which can present a problem depending on the attachment mechanism on your specific immersion circulator. One potential disadvantage is the effect of the hot water on the plastic liner of the cooler. Obviously the inside of the cooler is designed for cold temperatures not hot temperatures like the rest of the water bath containers covered in this article. It is unknown whether that poses any type of a safety risk. Plastic coolers are available just about everywhere in all sizes and shapes. Coleman and Igloo are probably the most common. You should not have any trouble finding one that is the size you need for your type of sous vide cooking. I have found a cooler from each major manufacturer on Amazon that are pretty good size and would be ideal if a larger water bath is required. Depending on your immersion circulator you would probably not want to fill these coolers to the top. The Coleman 33-Quart Party Stacker Cooler has internal dimensions of 16" (41cm) x 10.375" (26cm) x 9.375" (24cm). The Igloo 28 Quart Island Breeze Cooler is a taller container if that would suit your needs better. I believe polycarbonate containers are the most popular vessels used for sous vide water baths. These containers are clear and come in a plethora of sizes and shapes. They are actually designed and sold as food storage containers or food pans. There are number of vendors who make quality containers that are available at most food service and department stores. Since the container is transparent it's easy to keep an eye on how your food is cooking. The polycarbonate material holds the heat in the bath much better than the metal in a pot. Therefore less power is required from your immersion circulator. Since these are designed for storage they all have lids available. These are normally thin plastic and can be easily cut away around the circulator so that the lid can be in place while in operation. This significantly reduces evaporation and heat loss thus reducing the need for refilling the bath on long cooks. The containers are rectangular in shape which normally makes it easier to arrange sous vide pouches than in a circular pot. The polycarbonate material is designed to withstand temperatures greater than those used in sous vide cooking. For their size these containers are relatively light weight. The polycarbonate containers from the better vendors are actually quite rugged and durable. But I suppose if they were treated bad enough they would crack or break. Polycarbonate containers come in a wide selection of shapes, sizes, and capacities. Perhaps the greatest challenge is trying to decide which size container(s) would best suit your sous vide cooking. 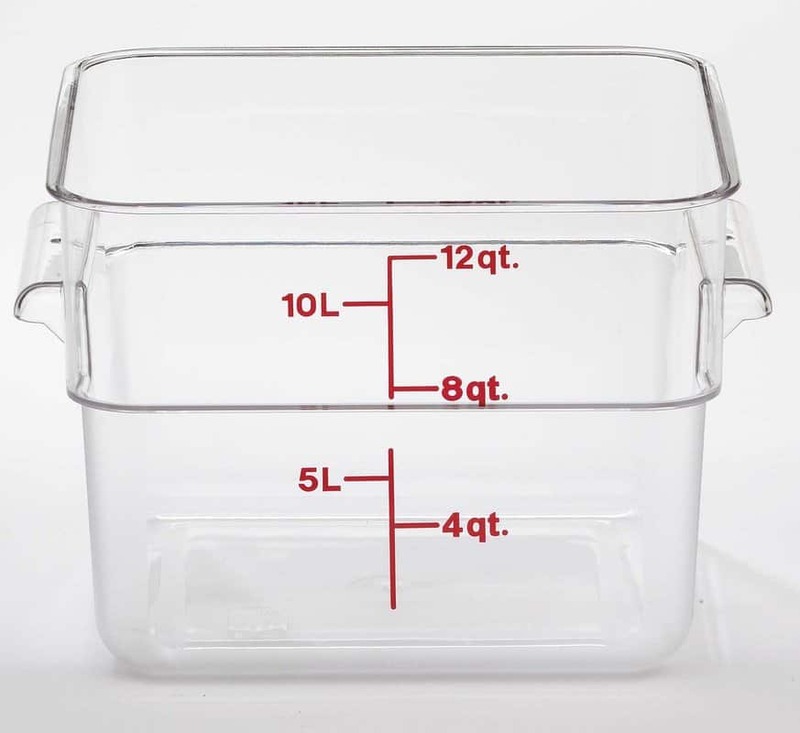 From my research it appears the most popular size polycarbonate container for a sous vide water bath is normally referred to as a 10 liter or 12 quart unit. It is typically about 11" x 11" x 9" (28cm x 28cm x 23cm). This is the size I use and it's good for 90% of the meals I prepare. Another popular size is referred to as an 18 liter or 4.75 gallon unit. It is roughly 12" x 18" x 9" (30cm x 46cm x 23cm). This size is great for large and/or numerous items such as an entire roast, pork shoulder or several racks of ribs. There are numerous manufacturers of these storage containers but the ones consistently recommended by sous viders are Cambro, Rubbermaid Commercial, and Lipavi. Another advantage to these manufacturers is that their products are available in numerous locations both online and off. I will highlight a couple containers from each of these manufacturers for your consideration. Cambro has been bringing innovative high-quality products to the food service industry for more than 50 years. They created the first plastic food pan and the first clear food storage container. Cambro has a large selection of food pans and storage containers that can be used for a sous vide water bath. In the eighties they began to export their products worldwide so that international sales now represents a significant portion of their business. So I believe it should be possible to get some portion of their products no matter where you may live. Arguably the most popular sous vide water bath container is the 12 Quart Camwear Polycarbonate Square Food Storage Container by Cambro. It cost around $23 and is approximately 12" (30cm) square and 8" (20cm) deep. This makes it relatively easy to get two or three of the gallon-size Ziploc bags into the water bath at one time. Both Jason and I use this container and have been very happy with it since it's a good size for the vast majority of what we sous vide. If you if you have a need for a larger sous vide water bath you may want to consider the Camwear 18CW135 Food Pan by Cambro. This pan is priced around $31 and is approximately 13" x 21" x 8" (33cm x 53cm x 20cm) and has the capacity of 27 quarts (25 liters). Rubbermaid Commercial Products produces a wide variety of products, a relatively small percentage of which are in their Foodservice area. Their products are usually less expensive than the similar Cambro product. Perhaps Rubbermaid's greatest differentiator is that their food containers are BPA free. There are new legislative requirements that call for alternatives to BPA in food contact materials, however, when using the container for a sous vide water bath the food is not actually touching the container. So I don't think it's that important - you may feel differently. Rubbermaid Commercial has a 12-quart Space Saving Square Container . It is about 11" (28cm) square by 8" (20cm) deep. It is available on Amazon for around $16. A larger container is also available from Rubbermaid Commercial. The 3-1/2 Gallon Food/Tote Box is about 12" x 18" x 9" (30cm x 46cm x 23cm) and is available on Amazon for around $25. Lipavi is mostly focused on the professional market but they have been expanding into the consumer market as well. They have both a 12 quart and 26 quart container. They also have lids specifically cut for the various sous vide machines and racks available to hold the food in place. Disclaimer: We have done business with Lipavi but we wouldn't mention them if we didn't like their products. Yes, you can cook sous vide in your kitchen sink. I know this is not very practical, but for completeness and fun I thought I would throw it in. 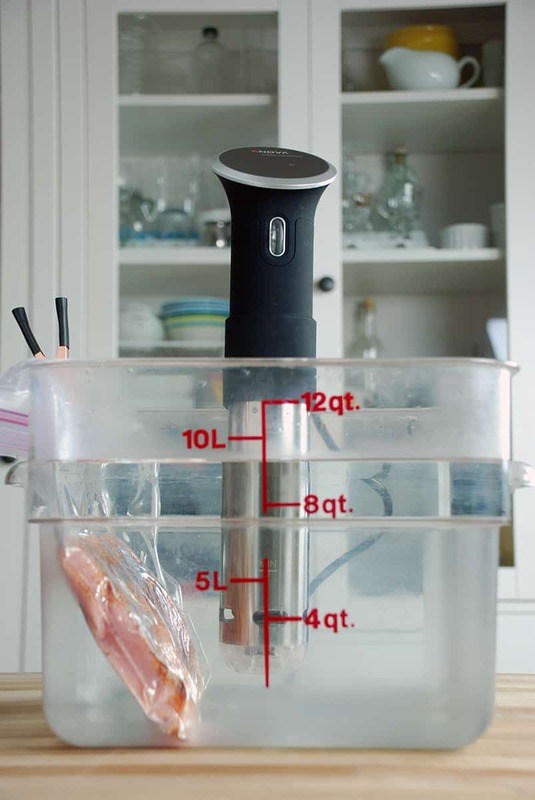 There are actually two ways to use your kitchen sink to do sous vide cooking. The first is just to fill the sink with hot water from your tap and put in your sous vide bags and let them cook. Obviously, this only makes sense for relatively short cooking times for things like fish. This video from Chow demonstrates how this can be done to cook a perfect salmon. 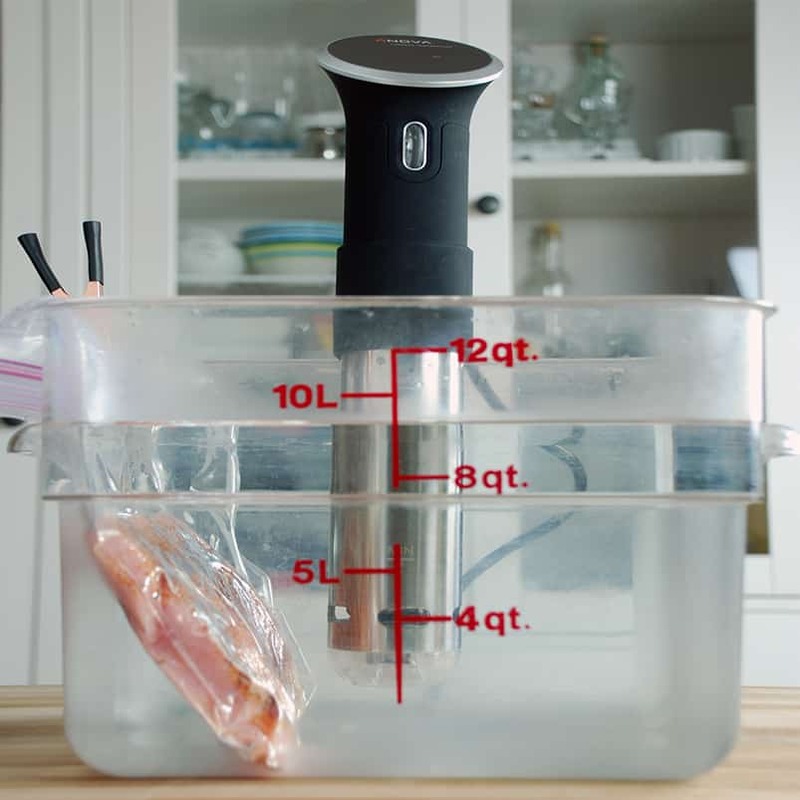 Another way is to just use the sink as a typical sous vide water bath and use your immersion circulator to heat and maintain the temperature of the water. If possible it's a good idea to cover a sous vide water bath with some type of covering. The cover will help retain the heat which will allow the bath to run more efficiently and take less energy. It will also significantly reduce the amount of water that evaporates on long cooks. 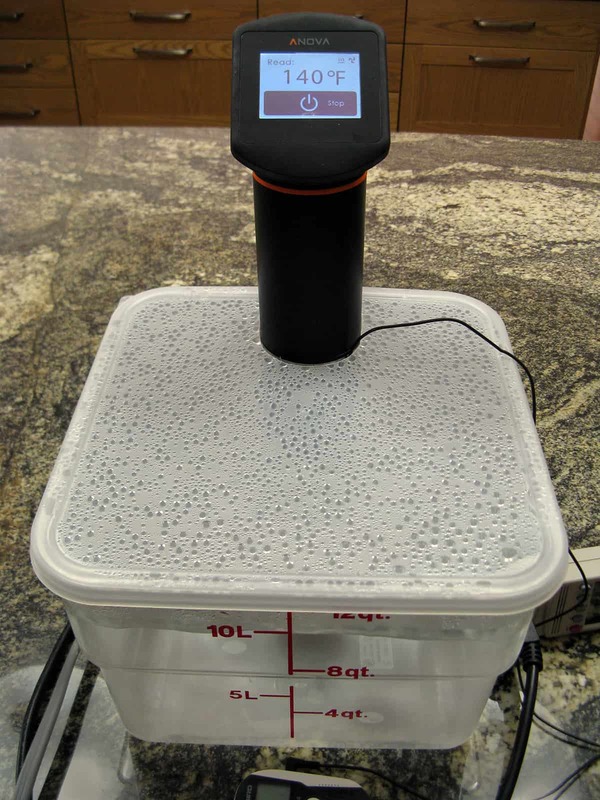 There are several options for covering a sous vide water bath and I will highlight them below. Using some type of aluminum foil, such as Reynolds Wrap, will work reasonably well on containers such as pans and coolers. The aluminum foil is very easy to form into a cover but it is metal and tends to transfer the heat out more than some of the other cover alternatives. Plastic food wraps such as Stretch-tite, Glad Cling Wrap or Saran Wrap work well as a cover for a sous vide water bath. They are very good at sealing the container keeping in the heat and eliminating evaporation. They have the additional bonus of being able to look through them as well. About their only downside is that they're not particularly easy to remove and then replace if you want to adjust the sous vide pouches or add additional water to the bath. One of the more unique sous vide water bath container covers that I have seen is to place a bunch of ping-pong balls on top of the surface. Similar to other covers the ping-pong balls help reduce heat loss and evaporation. The advantage of using ping-pong balls is that it's very easy to access the contents of the bath without having to remove the "cover". There are many options for sous vide-specific ping pong balls but it might be cheaper just to buy normal ones. If you are using a polycarbonate container there is a high probability you can obtain a matching lid. These lids are typically made of a plastic material that can be relatively easy to cut to make room for the immersion circulator using a pair of heavy scissors (kitchen or gardening) or a utility knife. Since the lids are made for the container they seal tightly and effectively keep in the heat and reduce the evaporation. They are also easy to remove to gain access to the contents of the water bath to reposition the sous vide pouches etc. For example, the matching lid for the Cambro 12-Quart container mentioned above is the Camwear Seal Cover for Camwear Square Food Storage Containers available at Amazon for about $6.00. 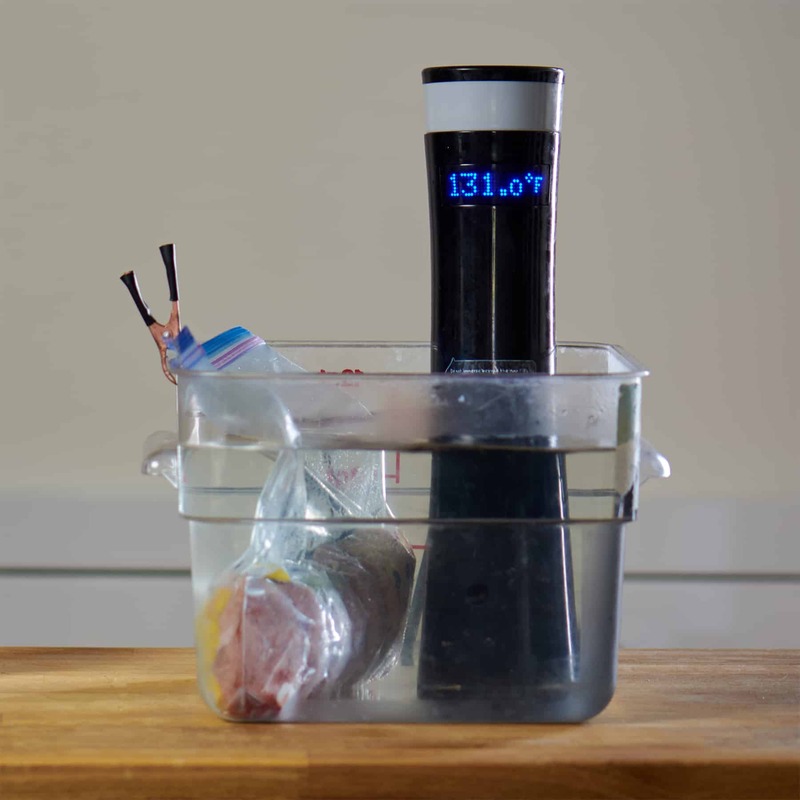 Your choice of sous vide water bath container should be based largely on the type of sous vide cooking you normally do. For example, if you often like to sous vide a whole rack of ribs, then you better get a container that's around 20" (50cm) long. If you just do a few chicken breasts, fish fillets and eggs, a good size stockpot would work just fine. If you are looking to purchase a container dedicated to being a sous vide water bath I would recommend a polycarbonate one with about a 12 quart (11 liter) capacity that is around a foot (30cm) square. 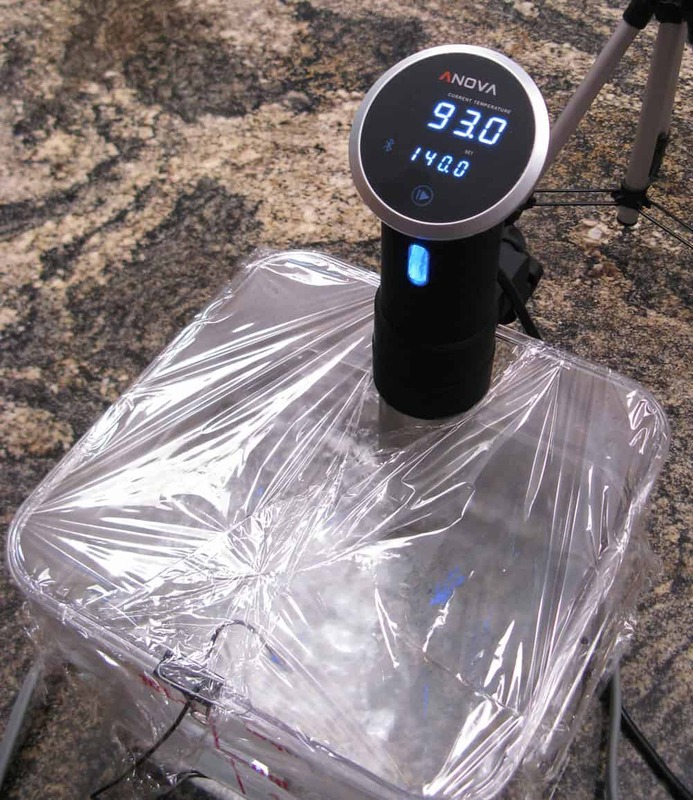 This will handle most typical sous vide cooking scenarios including several of the gallon size Ziploc bags or numerous of the quart size bags. It is a modest amount of water so it heats up fast and can be maintained at temperature with relatively low power. The earlier picture shows my sous vide set up which includes the 12 Quart Camwear Polycarbonate Square Food Storage Container by Cambro with the Camwear Seal Cover for Square Food Storage Containers cut to fit around the Anova Immersion Circulator . I hope this article has helped you decide what type of a sous vide water bath container would best suit your cooking needs. If you have any questions or feedback please leave it on Facebook or in the comments below. Happy cooking!